SC 30A | Tank Cleaning Technologies, Inc. The SC 30A is a single nozzle tank cleaning machine especially developed for sector cleaning tanks/cisterns/vessels in hazardous ATEX classified areas. SC 30A gives the user a possibility to optimize the cleaning, energy and cleaning media. SC 30A consists of two main parts; one washing unit that is fixed installed in the tank and one portable air driven drive unit SC 100, SC 100 PW or SC 180 for operation. The drive unit can be exchanged or removed without exposing the tank to the outside atmosphere. As option the SC 30A can be provided with a free selection of single nozzle levels giving a tailor-made installation for each specific need. SC 30A is produced in accordance with ISO 9001 Quality Standards and our certificate of conformity and accreditation is available on request. Additionally, the SC 30A conforms to United States ASME standards for construction and European, CE and ATEX standards for design, construction and safety. Cleaning Pattern Times 20 - 120 minutes; contact Tank Cleaning Technologies, Inc. for specific details on pattern times for this unit. 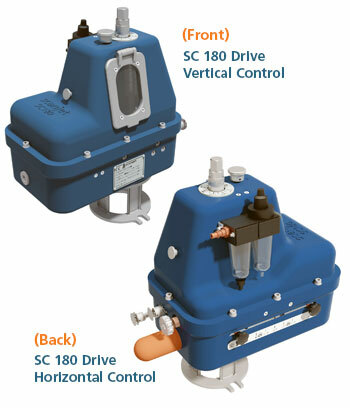 The SC30A is a programmable unit with pneumatic drive and cleaning pattern times can be varied. Lengths 1.5 meters to 15 meters (4.9 feet to 49.2 feet). Lengths over 3500mm may require supports. Weight Gun Unit Only: 44 kg for 1500mm length (96.8 lbs. for 59 inches). Weight per meter or 3.2808 feet is 10 kg or 22 lbs.